Ubuntu 11.10 Oneiric has dropped gnome screensaver. If you do prefer screen saver on you desktop when you’re not at your machine, you can install XscreenSaver instead. 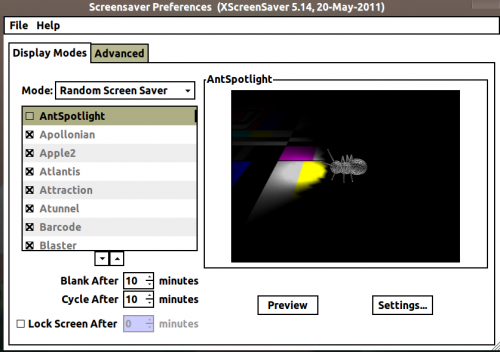 On X11 systems, XScreenSaver is two things: it is both a large collection of screen savers; and it is also the framework for blanking and locking the screen. XScreenSaver is available in Ubuntu 11.10 universe repository, just install it and plugins via Ubuntu Software Center. After installation, launch XScreenSaver and it asks to stop gnome screensaver and start xscreensaver. No user responded in " Install Xscreensaver(screen saver framework & locking) in Ubuntu 11.10 Oneiric "